His enduring legacy will probably be the stimulation to rethink the Son of Man question, in two key works, one in 1979 (Son of Man: The Interpretation and Influence of Daniel 7) and the other in 2007 (The Solution to the Son of Man Problem), which we were delighted to have in the Library of New Testament Studies series. Alongside this, and equally important, is his underlining of the necessity to study the Aramaic sources of the Gospels, especially in Aramaic Sources of Mark's Gospel (1998) and An Aramaic Approach to Q (2002). In spite of the importance of these contributions, he made his mark in other major ways too. His book on New Testament Christology, the result of his Cadbury Lectures in Birmingham in 1985, is probably the best, clearest presentation of the view he so clearly articulates in its title, From Jewish Prophet to Gentile God, and I still assign students passages from this book when we discuss early Christology. Like almost all of his writing, the strength of that book is that it develops a coherent and stimulating thesis and argues it with clarity and force. There is no messing about in Casey's writing. He doesn't just present data for the sake of it but marshalls evidence as part of a stimulating argument. He does what he needs to do without going on for ever, and his prose is crystal clear. One of his much underrated books is Is John's Gospel True? (1996) in which he robustly lays out the case for distancing John's Gospel from the historical Jesus. While many contemporary scholars disagree with the book, it's an ideal starting point for getting to the heart of the debate about John and history. Casey was writing right to the end of his life and although I am not as fond as his recent book on Jesus mythicism as I am of his other works, it would be fair to say that his big book on the historical Jesus, Jesus of Nazareth: An Independent Historian's Account of his Life and Teaching (2010), makes a major contribution to Jesus research. It's a lively read but it is also intense, passionate and full of the emphases that made Casey so important a scholar -- the emphasis on reading the source materials in their original languages, the importance of understanding accurately Jesus' historical context, and the stress on working as an historian and resisting the urge to warp the evidence with contemporary theological concerns. I was lucky to meet Maurice on many occasions while I was teaching at the University of Birmingham. Maurice was down the road at the University of Nottingham and was a regular at the conferences, and it was always a pleasure to chat to him at the British New Testament Conference. I think the first time I met him was in a taxi I shared with Maurice and Michael Goulder. They had been good friends for years, and my association with Michael instantly put me in Maurice's good books -- I always felt like I bathed a little in Michael's reflected glory. Although I never heard them talk about this, I suspect that they respected one another not least because it's not always easy being a scholar of religion when you don't believe in God. I have been sorry not to see more of him since I have lived in America, but I have happy memories of long discussions over dinner at the Oxford Synoptic Problem conference in April 2008. In spite of his occasionally acerbic and witty remarks about others, I always found him delightful, kind and very funny. I still remember clearly several elements in our conversation at dinner, at which his much-loved graduate student and close friend Stephanie Fisher was also present. One was the observation that scholars often get much more conservative the closer they get to the grave -- they are trying to write their way into heaven, he claimed. The other was a lengthy discussion about the properties of port, which, he felt, were insufficiently appreciated by many of those present at the conference. And so I am pouring a glass of port now and raising it to Maurice, who will be dearly missed, and whose like we may never see again. It's time for another quick round-up on the latest in the Jesus' Wife Fragment. Now that the documentary has aired, and people have had time to reflect on some of the recent developments, it looks like we are at the point where the story will begin to receive less attention on the blogs, and certainly less attention in the media. There is a kind of cycle here, and the experience of the last four weeks has been similar to the experience of September-October 2012. The major difference this time around was that the documentary, originally scheduled for 30 September 2012, actually aired (trailer). I must admit that I didn't watch it live, and although some of us have in the past live-tweeted documentaries like this, there didn't seem to be quite the appetite this time. So I went to our local cinema grill to watch the first two episodes of the new 24 instead, and watched the Jesus' Wife documentary on the DVR when I got home. I'm sorry if I sound shallow, but for me Jack wins over Jesus' Wife every time. The documentary itself was very little changed from the version that aired in France several months ago. There are several things I really enjoyed about the piece. The interviews with Karen King were captivating, and I greatly appreciated her lucidity and enthusiasm -- she is an absolute natural in front of camera. Likewise, AnneMarie Luijendijk was great. I had not seen her on TV before, and she was also a natural. Whereas all Prof. King's interviews appeared to take place at Harvard, Prof. Luijendijk was seen at Nag Hammadi (and we even got a retelling of the classic "find" story, jinn and all, in a single-person version, with an actor playing Mohammed 'Ali Al Samman) and the Coptic Museum in Cairo. The documentary tended to play to a narrative that scholars of Christian origins will find familiar -- an ecclesial authority that is associated with celibacy and suppression of women is pitted against an anti-ecclesial counter-narrative in which the Jesus' Wife Fragment is now alleged to play a part. In order to represent this visually, those speaking in favour of the fragment's authenticity -- Profs. 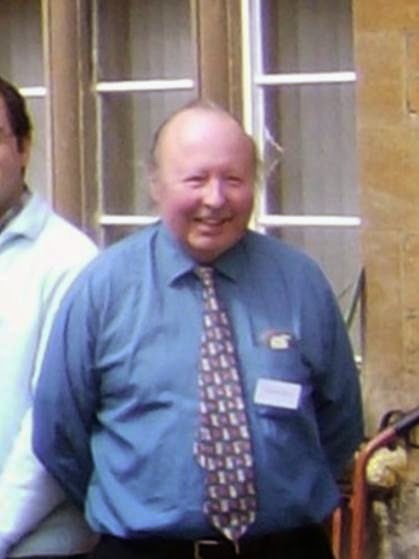 King, Luijendijk and Bagnall -- were all presented in academic contexts, at their computers, in archaeological sites, in museums, whereas the other contributors, Dom. Henry Wansbrough and Robin Griffiths-Jones, were presented in churches and in recognizably ecclesial garb. In so far as the forgery hypothesis came up, it was generally linked with "the Vatican", and the viewer was encouraged to think that it is only conservative types who were doubting the authenticity of the fragment. "In short, there's much new evidence for its authenticity and none that it's a modern forgery. The fragment will continue to stir controversy. Scholars will continue to debate its meaning. It will be some while yet before we can say whether the Gospel of Jesus' Wife is a footnote or a new chapter in the greatest story ever told" (emphasis original). (See the CNN HD version here). Like King and Luijendijk, Peppard is an absolute natural in front of camera -- he has a lightness of touch, and runs with the host's humour, but at the same time he is informative and lucid. By standing in front of graphic representations of the fragments, he is able to draw attention to some of the issues, including the writing round the hole. (Yet still, we are dependent on images extracted from Harvard Divinity's PDFs; it would be wonderful to see good digital images released for detailed study). Gastforscher Dr. Christian Askeland entlarvt angeblich antikes Schriftstück / "Der sichere Beweis hatte gefehlt"
. . . . Prof. Dr. Stephen Emmel vom Institut für Ägyptologie und Koptologie der WWU, der den Nachwuchsforscher betreute, war von der Arbeit seines Zöglings fasziniert. Erstaunt habe ihn, der schon 2012 Zweifel angemeldet hatte, die Entdeckung der Fälschung allerdings nicht, sei sie doch so offensichtlich gewesen: "Bislang hatte einfach der absolut sichere Beweis gefehlt", meint Stephen Emmel. Dass Christian Askeland seine Wege von der Kirchlichen Hochschule Wuppertal, seinem derzeitigen Arbeitgeber, an die WWU führten, sei ein glücklicher Umstand gewesen: "Er hat über die koptische Übersetzung des Johannesevangeliums promoviert. Somit war er genau der Richtige, der das entdecken konnte", sagt Koptologe Stephen Emmel. Die Fälschung hält er sogar für recht jung. "Sie dürfte in den vergangenen zehn Jahren entstanden sein", mutmaßt der Experte. ""We put it up on the screen, and we all sort of said, ‘Eeew,’ ” said Bagnall, one of the world’s leading papyrologists. “We thought it was ugly. And it is ­ugly. The handwriting is not nice — thick, badly controlled strokes made by somebody who didn’t have a very good pen.” (Boston Globe, 18 September 2012). The point was to note that its sister fragment was equally as ugly. Nevertheless, I do see that the use of the metaphor is unfortunate and offensive, and I would like to reiterate my apology also in this context, and to thank Eva for drawing attention to it. Update (Saturday, 1.42am): I forgot also to add a link to a characteristically interesting post by Jim Davila on Paleojudaica, Papyrus Forgeries?, in which he picks up on Roger Bagnall's statement, "I don’t know of a single verifiable case of somebody producing a papyrus text that purports to be an ancient text that isn’t" (New York Times). See also Jim Davila's earlier comments in GJW: Another Goodacre Round-Up. 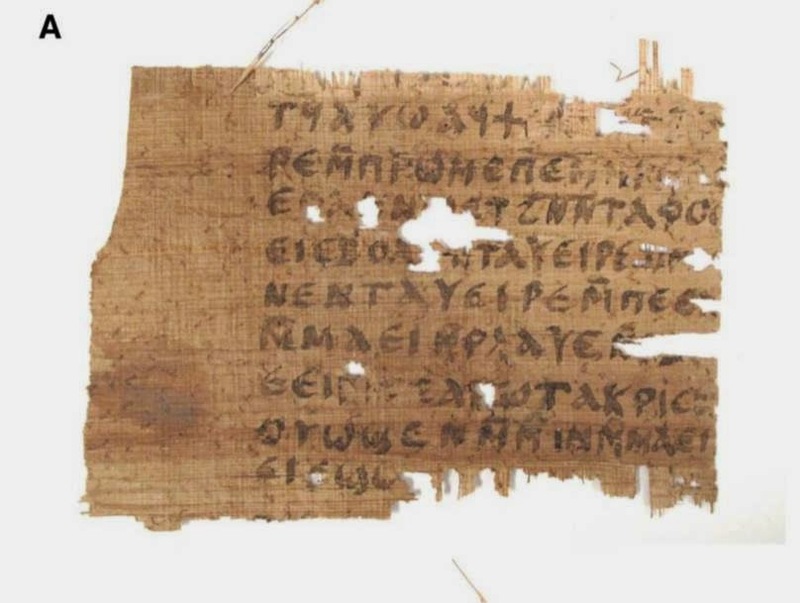 Note also that April DeConick is asking What are the facts about the Gospel of Jesus' Wife?, adding a note of caution about some bloggers' claims, and getting some strong support from James Tabor and Simcha Jacobovici, both of whom remain convinced about the authenticity of the fragment. Simcha complains about pseudo-academic nay-sayers like me. He calls us "sleeper-agents of Christian theology", though at the same time he notes that we "never sleep". The Library of New Testament Studies has a new editor! I decided several months ago that after several years as editor of the Library of New Testament Studies book series, the time had come for me to step down. I have greatly enjoyed working on the series, and I am proud with what we have achieved over the last few years, with a fantastic editorial board and tireless work from Dominic Mattos at Bloomsbury, and recently with help from Katie Broomfield. I have been editing the series almost as long as I have had a blog! When I took over as editor in 2004, I was living in Birmingham, England, and the series was known as the Journal for the Study of the New Testament Supplement Series ("JSNTSup" or "JSNTS"). It was published by Sheffield Academic Press, and it was of course associated with JSNT. I was approached by Philip Law and Rebecca Mulhearn, who were working for Continuum Publishers, which had just taken over Sheffield Academic Press, T & T Clark and Trinity Press International, eventually combining Biblical Studies and Theology titles all under the imprint T & T Clark International (later just T & T Clark). It was always a pleasure to work with Rebecca Mulhearn, and then also with Rebecca Vaughan-Williams and in recent years with Dominic Mattos. In fact, the scale of the work involved would make it absolutely impossible if it were not for such great publishers. We changed the series name to the Library of New Testament Studies in about 2005, if memory serves. This had become a necessity when the journal went to be published by Sage, so severing the link between the journal and the series. The new name was easy to choose, not least because T & T Clark were already using "Library of Biblical Studies" in advertisements, and it cohered with other series that had come from Sheffield to the T & T Clark stable like the Library of Hebrew Bible / Old Testament ("LHBOTS") and the Library of Second Temple Studies. While a great deal of the work is done by exchange of emails, running to thousands over the last decade, one of the most pleasurable aspects of the job are the contacts we have, and board meetings, at SBL Annual Meetings, International Meetings and so on. I think it's those contacts that I will miss most now that I am stepping down. I will also miss the intellectual stimulation that comes from discussing so many interesting and diverse projects with prospective authors, and scouting for strong manuscripts for the series. There is nothing more satisfying than pursuing a project with a new author, and seeing it through from its beginnings in a simple email, a tip or a conference presentation, to its full maturity as a published book. So this post comes by way of a massive thank you to those I have worked with over the last few years, my wonderful editorial board, all those who have read manuscripts for us, Rebecca, Rebecca, Alinda, Katie and most of all Dominic, who is a true star. But more importantly, this post is to announce that the new editor is Chris Keith, Professor of New Testament and Early Christianity and Director of the Centre for the Social-Scientific Study of the Bible at St. Mary's University College, Twickenham. I could not be leaving the job in better hands. Chris and I have been working together in the last few months during the transitionary period and I know he'll do a fantastic job. I am absolutely delighted that Chris will be at the helm and I want to wish him all the very best, and hope that he enjoys the job as much as I have. The post is also available as a PDF. It's all worth reading, but there is one particular piece that is worth highlighting: the scribe writes around a large hole in the fragment that was already present. As the scribe writes letters around the hole on the recto, his ⲛ (N), in particular, is almost comically small. In other words, the papyrus was already damaged before the scribe wrote on it. This is problematic because the writing on the verso goes into the hole and not around it, as if the damage happened after writing and not before. It is a scenario that only makes sense if we are dealing with a modern forger writing on an ancient scrap of already damaged papyrus. 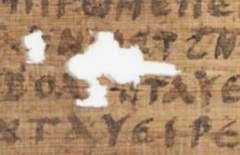 - [ⲛ]ⲉ̣ⲛ̣ⲧⲁⲩ, for us, was the final "smoking gun" of this fragment: I had already noted that there is no place for ⲛⲉ in the lacuna, and that the surviving trace does not present a convincing ⲉ, when Frederic Krueger drew our attention to the fact that ⲛⲧⲁⲩ clearly seems to have been written under and next to an already existing gap in the papyrus: notice how ⲛ is only half the height of the other letters of the line, how ⲧ is already able to get somewhat bigger, and how ⲩ is finally able to stretch to full normal height. According to me, if the damage had occurred after the writing of the text, at the very least the ⲛ should look different. The ⲛ (N), is very small and is written right underneath the hole; the ⲧ (T) next to it is larger, as proportions of the hole allow, and then the ⲁ (A) is larger and the ⲩ (U) larger still. It might be argued that the fragment was already damaged in late antiquity and that it is an eighth century scribe rather than a twenty-first century forger who wrote around the hole here. However, a hypothesis like this would run into problems in the light of the evidence from the verso, where the scribe appears to be writing as if there was no such hole. It is the curious nature of the scribal behaviour here that is so striking, simultaneously acting as if there is a hole present and as if there is not. At this point, I can't help thinking of Leo Depuydt's remarks in his article in the latest Harvard Theological Review with respect to the Jesus Wife Fragment. Like that fragment, it seems clear that this is a forgery, "and not a very good one at that" (HTR 107:2 : 172–89 ). Of course we await HDS's release of better pictures of this fragment, but on the evidence of what we have I am strongly inclined to agree with Krueger's and Hagen's judgement on Suciu's blog. It's in the Forgery 101 textbook that you do not write your text around existing lacunas in the papyrus fragment that you are using. To borrow a comment from Hugo Lundhaug, we now have enough smoking guns for an entire platoon. Update (2 May, 7.29am): I have revised the wording of the post above to take more careful account of a useful point raised by Brice Jones in comments, adding an extra sentence or so to paragraph 3 and writing a fresh paragraph just under the last illustration, beginning "It might be argued . . ."
Update (2 May, 6.48pm): four typos corrected, with thanks to Mike Grondin.